Have you ever looked enviously at a neighbour’s garden and wished you had a green thumb? Have you ever gone to the garden centre full of enthusiasm, only to find yourself confused and defeated? Have you ever wished that somehow gardening could just be, well, easy? If so, it’s time to Get Growing with Frankie Flowers. 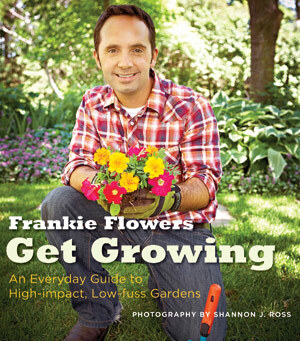 In 352 pages packed with inspiring yet instructional photos, Frankie coaches gardeners of all levels through the basics of getting a garden growing. Broken down into seasonal chapters that give the reader concise, clear instructions on what you need to do now and why, it provides a solid foundation for building a beautiful ornamental garden, a healthy, natural lawn and a bountiful vegetable garden. With tons of step-by-step detail — in words and photos — this book includes everything from planning and planting to pruning and fine tuning. It’ll also help gardeners of all levels troubleshoot problems like weeds and slugs and rodents (oh my!). Gardening shouldn’t be complicated or overwhelming — it should be fun. The secret is just to get outside and Get Growing!